I read and re-read my writing and ‘slice and dice’ wherever I can. Sometimes less is more. With regard item 5, “Low-income residents with leaking pipes can call out a plumber to fix leaks for free,” one should note that the whole sentence sounds peculiar. While I agree that “for free” can certainly be reduced to “free,” if the “Low-income residents” have leaking pipes, surely a urologist is a more suitable party to consult. Love the post. The last one on “past history” is particular to the medical field. The standard format for a medical record includes PMH (Past Medical History). It seems that scientific and medical writing has many idiosyncratic uses of redundant and wordy language; hence the plethora of examples for this post. I dislike the fact that medical writers often omit commas when there are multiple adjectives preceding a noun. …just doesn’t sound right to me. “Fix leaks free”? Free of what? Perhaps it’s my Britishness, but it grates on me almost as much as “write” for “write to”. A plumber will make free repairs to leaking pipes for low-income residents. Very useful Mark, thanks again. Er… I suppose ‘again’ is redundant? That is economy of words! @Julie: I like the Hemingway quote, but are we talking about economizing on words or simply removing extraneous ones? There are plenty of situations where economizing is rightly the goal: academic papers and newspaper articles, for instance. In others, an over-eager paring might leave the text all skin and bones, and hence dull. Every one of those sentences is badly constructed. All could be rendered at no more than 75% of the length – and their meaning clarified in the process. Residents on low incomes can get leaking pipes fixed free of charge. “Low-income residents” is insulting compared to “Residents on low income”; “free of charge” confers clarity. As Capote commented: I believe more in the scissors than I do in the pencil. Concision leads to clear, elegant writing. 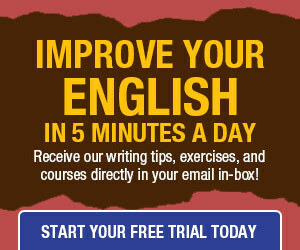 Here’s one of our tips on concise writing from 300 Days of Better Writing: Remove “what is” and “what are” phrases. We already know that “to be” verbs weaken writing. Examples of to be verbs are “is,” “am,” “was,” and “are.” These words are also problematic when combined with “what” to make “what is” and “what are” phrases. Consider these sentences. In both sentences, the weak phrases can be removed without making any other changes in the sentences and without changing the meanings. This is a clue that the phrases can, and should be, removed. They don’t add value, just more words. The revised sentences are as follows. You might not be able to do this in every case, but when you see those weak phrases, remove them and evaluate the revised sentences. 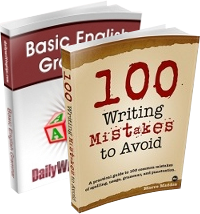 In most cases, the writing will be more direct and concise. Here’s another of our strategies for concise writing, this time dealing with using the right subject and action: Focus on the actor for concise writing. To write clearly and concisely, you want to use the main actor (i.e., rhetorical subject) as the main subject. This lets you remove unnecessary, but common, phrases at the beginning of sentences. Consider this sentence. In this sentence, the subject is “way.” However, the main actor (i.e., the rhetorical subject) doing the main action (“confuse”) is “writer.” Writers are doing the action being described by this sentence, so “writers” should be the subject. When we use “writers,” we get the following possible revision. >>The words that follow “The reason is that” comprise the explanation…. The explanation comprises the words that follow…. Yes, as I was writing this article about comprise, I noticed that I had used it incorrectly several times on the site. Constitute is another possible replacement. On #8, I would also delete the word “the” from before “patient” and “physician.” “This step gives both patient and physician the freedom to decide … ” etc. I like your article very much, and I am generally a great proponent of avoiding unnecessary words. However, I feel that all writing bears a poetic component, which could be compromised if one were simply to remove every “that is” or “who is” for the sake of minimizing word count. Certain words and phrases obviously weaken a composition or oration, such as (your example) “the reason that…” or (my favorite) “what you want to do is you want to…” However, a writer may at times choose to include an otherwise nonessential word for emphasis, such as in the “two different methods” example you cited, or to provide a harmonious rhythm.